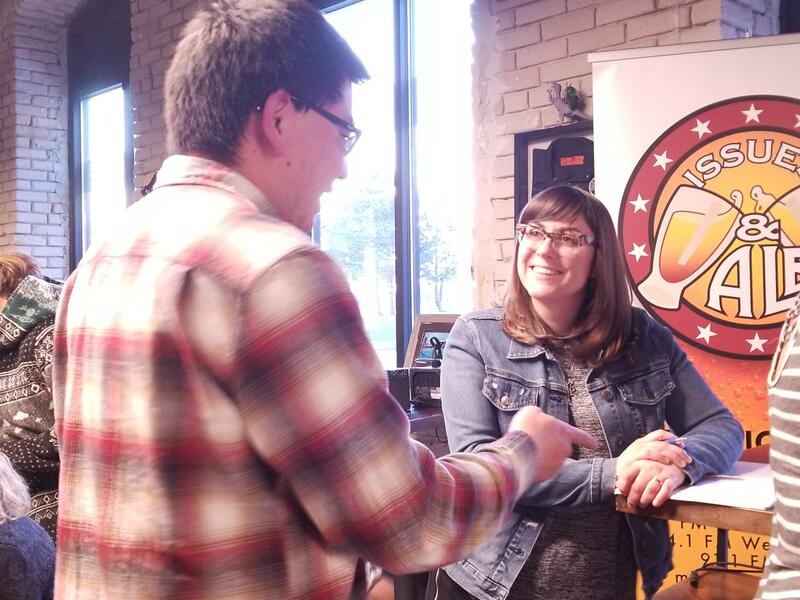 Hosts of Michigan Radio’s That’s What They Say, Rebecca Kruth and Anne Curzan, took over the latest Issues and Ale event in Grand Rapids to discuss an ever important issue to many public radio listeners: language and grammar! The pair led our audience in an educational, enlightening, and often hilarious conversation about everything from the newest slang, to the impact of texting on language, to the ever-controversial, Oxford comma. Quite a few current and former English teachers, folks who learned English as a second language, and language enthusiasts in general (yes, we do exist) came out to join in our ‘Grammar Night” fun over pints. Grand Rapid’s City Built Brewery opened their doors on the Monday night especially for the Michigan Radio event. Our pair of hosts offered up some interesting factoids about their English language credentials: Rebecca shared that she too was one of the teachers in the room, having spent some time as a high school English teacher long before following her path into broadcast. 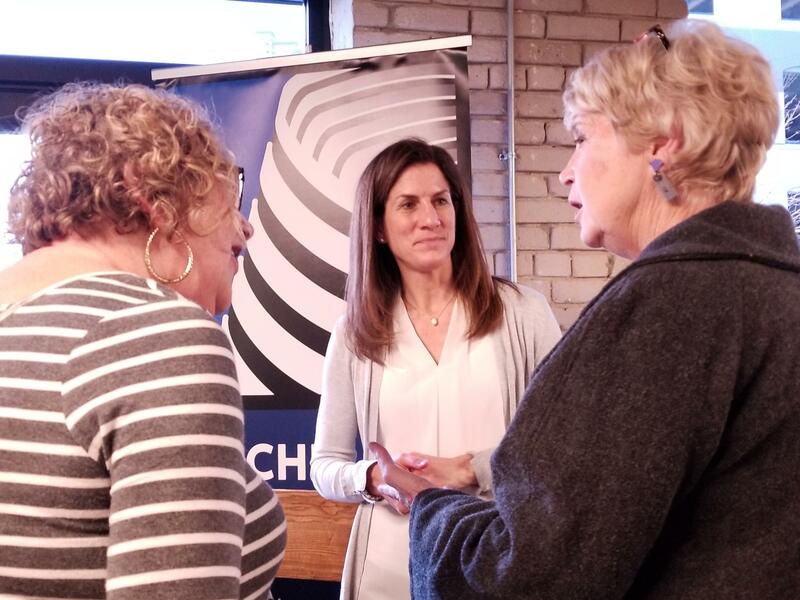 To the crowd’s surprise, Anne, the University of Michigan Professor of English and regular on Michigan Radio, revealed that she went into college intending to major in Math! The beloved linguist only ended up in language study after realizing a passion for the history and origins of language in an early English class. Anne and Rebecca spent much of the evening answering questions from the audience, many of which prompted Anne to remind others how exciting it is that language changes and evolves and that, instead of insisting on rules and standards, we should embrace the journey language takes us on. However, that didn’t stop the room peppered with 'language sticklers' and 'phonology tyrants' from groaning at their most hated grammar pet peeves. Rebecca Kruth takes listener recommendations for future TWTS topics. As much as some ‘go grammando’ as language purists, the crowd was chuckling more than anything else throughout the evening. At one point, Anne jokingly encouraged our listeners to disrupt conversations by experimenting with removing what linguists call “back channeling." She said if you pay attention to yourself in a conversation on the phone or in person, you’ll hear yourself say, “uh huh, uh huh, uh huh” and nod every so often so that others know you’re listening and in the conversation. So, she suggested in your next conversation, “Don’t nod, don’t make any noises and sit there and watch… and see how long it takes before they say ‘are you angry?’” she laughed. One of the coolest moments of the evening though – to us word nerds in the crowd – was Anne’s recitation of the first few lines of Beowulf in the proper old English dialect (hear it at the 11:10 mark in the audio above)… “So I study: how do you get from there…to texting,” she said to laughs. The hosts explained their That’s What They Say topic list is so long, they’ve gotten so many suggestions, that they haven’t been able to answer many of them on the show. They did their best to fit a good number of them in the night’s language breakdown – only to get many more recommendations at the end of the show! Based on the excitement of the audience, That’s What They Say will certainly be taking on more language issues at Issues & Ale again soon, keep an eye out to join us at the next Issues & Ale: Grammar Night. Anne Curzan speaks with audience members after the show.